The Katanga province, Democratic Republic of Congo, hosts world-class cobalt deposits accounting for ~50% of the world reserves. 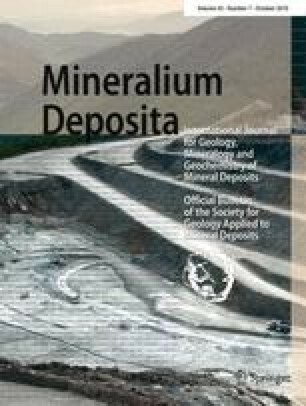 They originated from sediment-hosted stratiform copper and cobalt sulfide deposits within Neoproterozoic metasedimentary rocks. Heterogenite, the main oxidized cobalt mineral, is concentrated as “cobalt caps” along the top of silicified dolomite inselbergs. The supergene cobalt enrichment process is part of a regional process of residual ore formation that also forms world-class “manganese cap” deposits in western Katanga, i.e., the “black earths” that are exploited by both industrial and artisanal mining. Here, we provide constraints on the genesis and the timing of these deposits. Ar–Ar analyses of oxidized Mn ore and in situ U–Pb SIMS measurements of heterogenite yield Mio–Pliocene ages. The Ar–Ar ages suggest a multi-phase process, starting in the Late Miocene (10–5 Ma), when the metal-rich substratum was exposed to the action of meteoric fluids, due to major regional uplift. Further oxidation took place in the Pliocene (3.7–2.3 Ma) and formed most of the observed deposits under humid conditions: Co- and Mn-caps on metal-rich substrata, and coeval Fe laterites on barren areas. These deposits formed prior to the regional shift toward more arid conditions in Central Africa. Arid conditions still prevailed during the Quaternary and resulted in erosion and valley incision, which dismantled the metal-bearing caps and led to ore accumulation in valleys and along foot slopes. The online version of this article (doi: 10.1007/s00126-010-0305-8) contains supplementary material, which is available to authorized users. This study is part of the GECO project (Belgian Federal Public Service for Foreign Affairs) and the TRACE project (Belgian Federal Science Policy Office). Jacky Cailteux (EGMF) provided easy access to the Luiswishi quarry, as well as stimulating comments and discussion. A. Bernard and L. Fontaine are thanked for their contribution to the study of the Kisenge deposit. The authors are indebted to Bernd Lehmann for his constructive and helpful editorial handling of the manuscript.